Based on the way I invest, shares of TerraForm Power and STAG Industrial looked like great options for me. Here's why. I don't fall into the demographics of your prototypical dividend investor. I'm relatively young, and I don't anticipate needing the income from dividends any time soon. 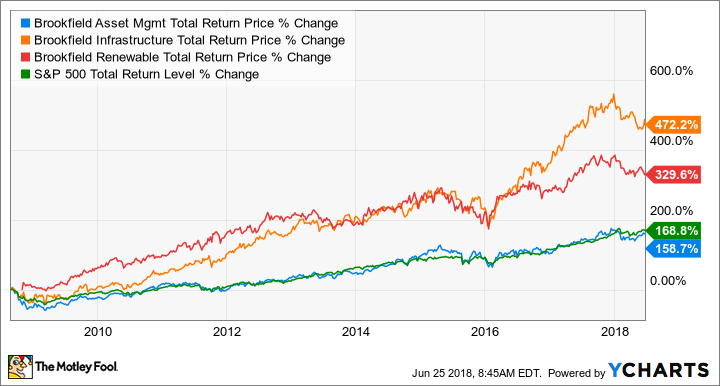 What I do have, though, is a very long-term investment horizon that allows me to take advantage of one of the most powerful wealth-building tools: reinvested dividends. Assets or a business model that have a decent level of clarity over the next 5-10 years. That can be assets with long-term revenue contracts or a hard-to-disrupt business. A management team that has proven itself to be good stewards of shareholder money with prudent investments and an eye on keeping its balance sheet from becoming overloaded with debt. A company that isn't promising an overly generous payout or gaudy dividend growth numbers. I'm in no rush, and companies that promise exorbitant yields or growth rates tend to not live up to those promises. TerraForm Power, a subsidiary of the now-bankrupt SunEdison, was an appealing investment from the get-go because of its assets. It was a collection of solar and wind power generating facilities that had solid customer contracts in place that would ensure stable revenue streams for more than a decade. The problem for TerraForm Power was its parent company, which was compromising the financial strength of both itself and its subsidiaries to pursue an overly aggressive growth plan. SunEdison's Icarian story is relatively well covered, but one thing that hasn't been discussed is the fate of TerraForm Power. As part of SunEdison's bankruptcy, asset manager Brookfield Asset Management took control of TerraForm Power. Over the years, Brookfield has built a stellar reputation putting together investment funds or partnerships in other asset-heavy industries like toll roads, hydroelectric power, and real estate, and all of them have performed incredibly well thanks to the Brookfield blueprint. 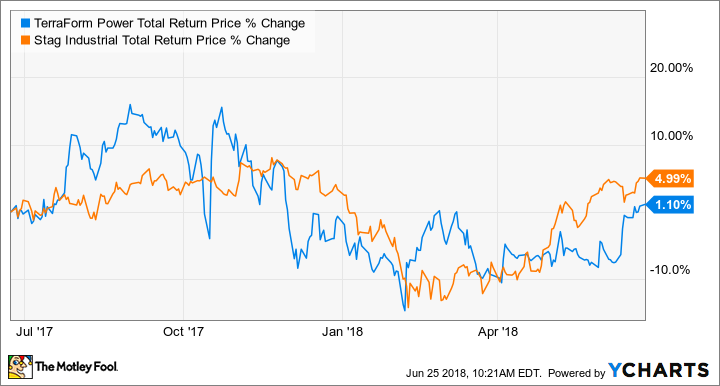 Two of Brookfield's longest-tenured subsidiaries -- Brookfield Infrastructure Partners and Brookfield Renewable Partners -- have performed incredibly well on a total return basis (price appreciation plus dividends) over the past decade. Rather than pursue aggressive growth or egregiously high payouts in these capital-intense industries, Brookfield's aim is to combine a good yield with modest, consistent growth. It also embraces the idea of plowing a decent chunk of internally generated cash into growth such that it isn't wholly reliant on the whims of Wall Street bankers. Now that TerraForm Power is part of the Brookfield family, Brookfield is molding TerraForm in the image of its other partnerships. Its plan over the next few years is to squeeze out operating costs and pay down debt to free up the cash already coming in the door. That alone gives the company a reasonable growth runway over the next few years. With a dividend yield of 6.5%, plans to grow its bottom line with simple in-house fixes, and a longer-term ability to capture part of the multitrillion-dollar opportunity in renewable power, there is a lot of potential for shareholders to generate total returns from an investment in TerraForm Power. Typically, the kinds of assets that real-estate investment trusts want to own or acquire are multi-tenant buildings that reduce the risk of vacancy. The more apartments or offices in a single building, the lower the risk of having an unoccupied unit. That means single-occupancy buildings like, say, distribution warehouses, aren't high on a REIT's buy list. This dynamic is what makes STAG Industrial such an interesting REIT. It eschews conventional knowledge and invests in these single-tenant industrial facilities. STAG's management believes that because these aren't attractive assets for most other REITs, it gets to play in this sandbox all by itself and acquire assets that sell at a discount. To mitigate the occupancy risk, the company maintains a robust portfolio of facilities such that a couple of vacancies aren't going to break the business. With over 360 facilities across the U.S. with no single customer representing more than 2.5% of revenue, the diversity of its assets and customers helps to mitigate the greatest fear most other real-estate investors would have concerning these kinds of properties. TERP Total Return Price data by YCharts. The underlying business is certainly sound, but what is probably more important to an investment like STAG is that it has a management team that is very effective at creating value with its portfolio. Whenever there is an opportunity to sell a property at an attractive capitalization rate (real-estate lingo for a rate of return), the company has done that so it can either invest in constructing new facilities or finding other mis-priced assets. Management has developed a solid reputation of managing its portfolio between new construction, acquisitions, and disposals to create value for shareholders in the long run. One thing that could certainly impact STAG over the long run is a recession or contraction in industrial activity in the U.S. More than 25% of its tenants are in either capital goods or automotive, which makes the business intricately tied to industrial output. The thing that assuages the worries over this happening is the company's staggered lease expirations and management's ability to steer the ship through tough times. Leases are staggered such that the year with the most lease turnover over the next decade is only 15.9% of total revenue. So, even if we were to see a year or two of poor tenant renewal rates, the company would still have a rather robust portfolio of rents. Plus, management has done a great job thus far of maximizing value and being good stewards of shareholder capital, so it's worth giving them the benefit of the doubt when the tough times hit. Shares of STAG industrial have a dividend yield of 5.2%. Shares have historically traded for a higher yield than that, which suggests that shares may be a little pricey today. Looking over a decade-long time horizon, though, a stock with a 5.2% yield and a reasonable growth runway seems like a worthwhile investment.